A few years ago (quite a few, actually) I went travelling through Europe. Some of the trip I did with a dear friend of mine, some I did on my own. One of the things I discovered was drinking yoghurt. Now, drinking yoghurt (i.e. yoghurt which is thicker than milk, but thin enough to drink like a smoothie) used ot be not uncommon in South Africa when I was little, but it’s almost unheard of in Australia to the best of my knowledge. I remembered liking it as a child, so I tried some in the Netherlands, and in Italy. It exceeded my expectations in every way. My cherry-flavoured (but not too sweet) yoghurt drink became a daily thing while I could get it, and I’ve missed it ever since. I like eating regular yoghurt, but there’s something about fruit-flavoured drinking yoghurt on a hot summer day that is just very appealing to me. I tried making yoghurt and just fermenting it less long, to get a thinner consistency. Did not work out well. I tried making smoothies with yoghurt, fresh milk, and fruit. Those are pretty good, but not what I was after. So I did some research, only mildly hindered by the fact that while I was enjoying my cherry yoghurt drink in foreign climes I couldn’t read the local language so I had no idea what it was called (brand name or generic term), or what was in it. I came up with a variety of alternative cultured milk products which are described as being yoghurt-like, and traditional to various parts of northern Europe. All are heirloom cultures, meaning that they’ve been maintained as live ecosystems over the years, and you can continue to use a sample form one batch to make more basically forever (many store-bought yoghurts only contain a few species, and without the support of their mutualist ecosystem partners will fail and die – and stop producing yoghurt – after a few batches, requiring a new starter). For my birthday this year, my very on-the-ball mother acquired for me a selection of starter cultures. Today I’ve put three of them (viili, filmjolk, and langfil) in to ferment, to see how they go. I would have done the other two cultures as well, but I don’t have enough milk in the house to do that many batches, so the piima and the buttermilk will have to wait for next time. I’ll report back in the comments on the results of the fil mjolk, langfil, and viili experiments. Start with some full-cream dairy milk. It can be whatever milk you like – goat, sheep, camel – but I used regular cow’s milk from the supermarket. Avoid UHT milk if possible. If you can get non-homogenised milk, that’s better as well, but go with what you can get. Heat some of the milk (300 – 500 ml per culture type) up to almost boiling (about 60 – 80 degrees C, the scalding point or point where small bubbles start to form on the surface but before you reach a rolling boil). Be careful not to burn it. Once the right temperature is reached, turn off the heat and cover the milk; wait for it to cool to just below body temperature (about 25 degrees C if you have a thermometer, or luke-warm if you’re going by touch). Stir your starter (about 1 tsp of dried or freeze-dried starter, or 1 – 2 Tbs of active cultured milk product) into the luke-warm milk. Pour into your cleaned and sterilised container (either a small thermos or a glass jar – sterilise with boiling water) and put the lid on. If using a glass jar, wrap a towel or tea towel around it for insulation. Once the yoghurt (or whatever) starts to firm up or change consistency, place the container in the fridge for 12 – 24 hours before eating. Remember to save some for the next batch. All the cultures I’m using are mesophilic, which means they ferment at room temperature (around 20 – 25 degrees C). Standard yoghurt is thermophilic, meaning that it likes warmer temperatures to ferment properly. That’s why you use a yoghurt maker for regular yoghurt, and mix the starter in when the milk is around 30 – 37 degrees C.
Piima is a Scandinavian yoghurt which is known to have the thinnest consistency of the mesophilic (room temperature) yoghurts, similar to buttermilk. It is sometimes described as having the consistency of honey. It also has a mild, slightly nutty or cheese-like flavour. When used to ferment cream, it makes a good sauce for vegetables. Apparently it originates from natural (wild) cultures found in the milk of Scandinavian cows which have eaten the butterwort plant. It contain the following probiotic species: Streptococcus lactis var. bollandicus and Streptococcus taette. ; note that Lactococcus lactis subsp. lactis. used to be known as Streptococcus lactis. Cultured Buttermilk (as opposed to the liquid left after churning butter from cream, which is also called buttermilk) has a fascinating history. It can be consumed as a beverage (sometimes sweetened, but also sometimes as a savoury tomato-juice style beverage with salt and pepper and no sweeteners), but is more often used in baking and cooking. In baking, the acidity is used to activate sodium bicarbonate as a raising agent, or increase the activity of baking powder (which is itself sodium bicarbonate with an acid added to activate it when wetted). It can be used in marinades, where the acidity helps tenderise meats, or in sauces and salad dressings where the sour flavour works well. According to Wikipedia, the probiotics in cultured buttermilk are: Lactococcus lactis (Lactococcus lactis subsp. lactis, Lactococcus lactis subsp. cremoris, Lactococcus lactis biovar. diacetylactis and Leuconostoc mesenteroides subsp. cremoris); note that Lactococcus lactis subsp. lactis. used to be known as Streptococcus lactis. Viili is thought thought to originate in Sweden, although it is consumed throughout Scandianvia under various names. It has a viscous consistency like thick honey, and forms strands and trails the way sugar syrup does. The flavour is reported to be mildly sour, almost faintly sweet by comparison to other cultured dairy foods. Contains the following probiotic species: Lactococcus lactis subsp. cremoris, Lactococcus lactis* biovar. diacetylactis, Leuconostoc mesenteroides subsp. cremoris and Geotrichum candidum; note that Lactococcus lactis subsp. lactis. used to be known as Streptococcus lactis. Fil Mjolk is not as thin as piima, nor as viscous as viili, having a texture somewhere in between (like a soft custard or regular store-bought yoghurt). The flavour of fil mjolk is described as ‘bright’ and tangy, like a good, sour yoghurt. It contains probiotic bacteria from the species Lactococcus lactis and Leuconostoc mesenteroides; note that Lactococcus lactis subsp. lactis. used to be known as Streptococcus lactis. Langfil is a variant form of fil mjolk which has a ‘long and elastic texture’, a little like viili, due to the presence of yeasts and bacteria which form polysaccharides during fermentation. It can be thicker than regular fil mjolk, but the flavour should be very similar – sour and tangy. It’s sometimes eaten with ground ginger. In addition to the probiotics found in fil mjolk, it contains Lactococcus lactis var. longi. There are some good comparisons of the probiotics in each culture online. A quick warning for anyone who is squicked by reading about killing animals – this post is about death. Specifically, the death of chickens (roosters). There are no graphic pics, however. One of the parts of keeping pet chickens that isn’t so often talked about is what to do with the extras. The hens who’ve stopped laying, the roosters which inevitably hatch from about half the eggs you or your broody mama chook incubate. If the birds are pets, you can simply keep hens who’ve passed their laying years – but most people don’t. Councils restrict the number of chickens you can keep, and most people keep chickens for the eggs as well as the companionship so unproductive hens aren’t worth keeping. And roosters – well, most councils won’t let you keep them at all, and even if you can have them, having more than one or two is a noisy and unproductive pain in the rear. 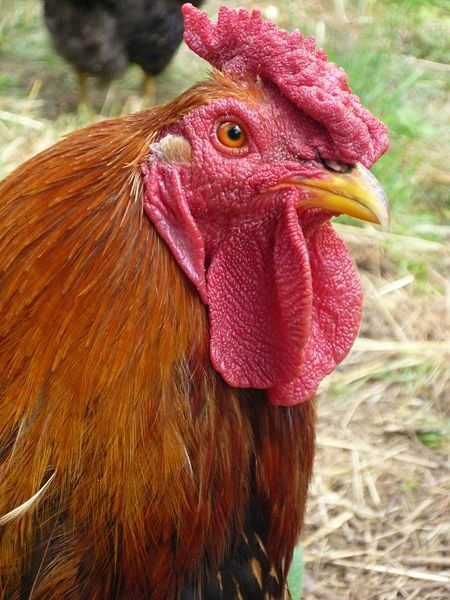 We do have some roosters, because we want fertilised eggs to hatch more chickens, and because roosters are the last line of defence for your flock against foxes. Sometimes a devoted rooster will actually drive a fox or hawk off before they take any hens, although the rooster often doesn’t survive the conflict. However, there’s a limit to how many roosters we can keep, and the ones which try to peck me when I feed them are always going to be the first to go. So last weekend, we held a rooster cull; we killed, bled, plucked and gutted the two extra roosters (known for the last few weeks as Pecky McPeckyface, and Bitey McBiteyface). One gold laced wyandotte, one white silkie. Plucking really isn’t that big a deal if you’re only doing one bird at a time and can finish before full-on rigor mortis sets in. Dipping the bird in hot water to loosen the feathers is not necessary. The birds sat in brine overnight (10% brine, with some added rosemary because the flavour really does settle into the muscles). 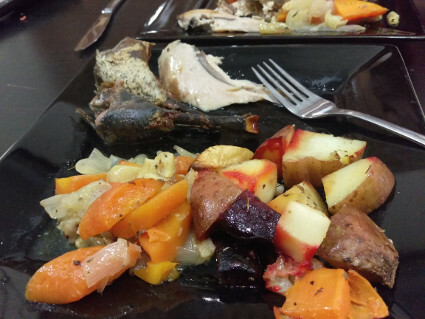 The Wyandotte went in the freezer, but the silkie turned into roast chicken for dinner last night. The flesh wasn’t as dark as I expected (silkies have black skin, flesh and organs – it’s a genetic trait called fibromelanosis), but it tasted delicious anyway. K used a Jamie Oliver recipe which called for an entire lemon in the cavity to infuse the bird with lemony goodness, and it was amazing. 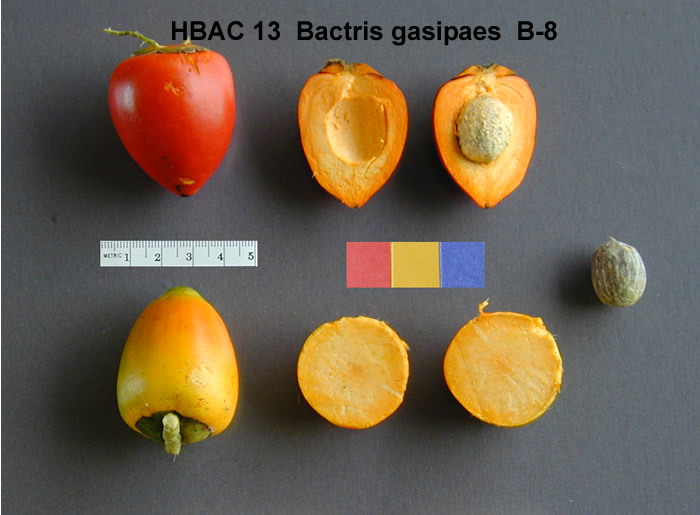 The peach palm or pejibaye (Bactris gasipeas) is native to the lowland tropics of South and Central America. 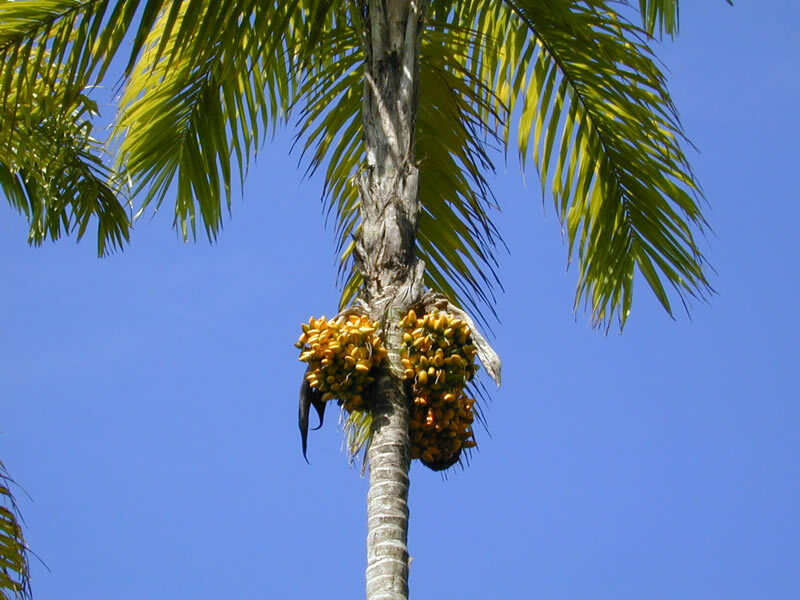 It was domesticated during the pre-Columbian era by the indigenous peoples of the Americas, and both the fruit and seeds have been used as food since then. The texture of the fruit, raw or cooked, has been compared to a firm sweet potato, and the flavour is similar to squash, buttery potato, or roasted chestnut. Undamaged, raw fruits will keep well, gradually dehydrating, in a low humidity environment with good airflow. Bruised or damaged fruits, however, will ferment in only a few days. Cooked fruit will keep for 5 – 6 days. The fruit can be dried and ground as meal or flour, which can be used as a replacement for cornmeal, or stored as dried chips. It can also be pressed to produce an edible oil. Raw peach palm fruit contains calcium oxalate crystals, which can be irritating to the mouth and digestive system, so the fruit should be cooked before being consumed. Traditionally, the fruit is often slow cooked for three to five hours in salted water before being eaten, but half an hour or slightly less in a pressure cooker, oven or microwave will dissolve the calcium oxalate crystals, making the fruit safe to eat. Cooked fruit may be deep-fried or roasted and eaten as a snack, or may be used as a stuffing for poultry. It can also be mixed with cornmeal or flour, milk and eggs, and fried to form griddle cakes or pancakes. *Note, as I don’t (yet) have access to any peach palm fruit, I haven’t tested this recipe. I’d love to hear what people think of it, though! Mash the peach palm fruit to a fine puree. Combine all ingredients. Mix to form a loose batter. Add olive oil or butter to a pan and set over medium heat. Drop teaspoonsful of batter into the hot pan and cook until golden brown on both sides. The food, as expected, was amazing. We started with fresh focacia bread spread with butter and honey (from Southern Forests Honey) and cider from The Cidery & Blackwood Valley Brewing Company. That was followed by grilled lamb (grass-fed dorper lamb from Blackwood Valley Beef), then gnocchi with a pork ragu using chestnut-fed pork from Chestnut Brae, and more melt-in-your-mouth gnocchi in a chestnut cream sauce. We followed that with roast chicken (from Southampton Homestead) with polenta, leeks and kale, and finally grilled tamarillos with custard (made using eggs from The Organic Fine Food Company). There must have been around 30 people there, and everyone cleaned their plates. The food being excellent was no surprise – I have a very high opinion of our local producers, and the Blackwood River region has gorgeous soils and good rainfall. What did surprise us was how casual and friendly it was, how much the farmers appreciated everyone just showing up. This wasn’t an expensive event, and they honestly seemed surprised that they had sold out. The group of producers is a newly formed collective (only about 4 weeks old) of individual producers who want to share information and skills, and help each other out to produce and market the best food they can; I’d say they’re succeeding very well. I’d also suggest that everyone check out these six producers because wow. So much deliciousness in one go. We had no idea going in that the intended audience (and indeed, most of the attendees) were chefs, media, and food industry people. Previously I’ve been to similar events, but only those aimed at the general public, so it was really interesting to see the differences (and similarities) in the kinds of questions asked of the producers. Also interesting for us were some of the lessons learned that the farmers shared, like the dangers of running pigs directly under the trees of the chestnut orchard without putting rings in their noses to stop them digging up the trees, and the conversations about the potential for starting a small or even mobile abattoir for the region. The main reason we aren’t considering commercial meat production ourselves is the difficulty of getting animals to (a) any abattoir, since they’re all quite a long way away from us, and (b) the stress involved for the animals in such a long trip. A mobile abattoir would be perfect. I’d love to see more events like this – I spoke to so many people who would have loved to go if they’d known about it a little sooner. I’d love even more to be able to be involved in them and start contributing – we’re a couple’ve years off having any sort of commercial product quantities, but I’m taking so many notes that even K laughs at me for it. And we’re slowly gathering some potential customers and some market data. It’s exciting, starting to see it all coming together – and last night was really inspiring for us. Soon, the Tastes of Chittering will be a thing too. Soon. 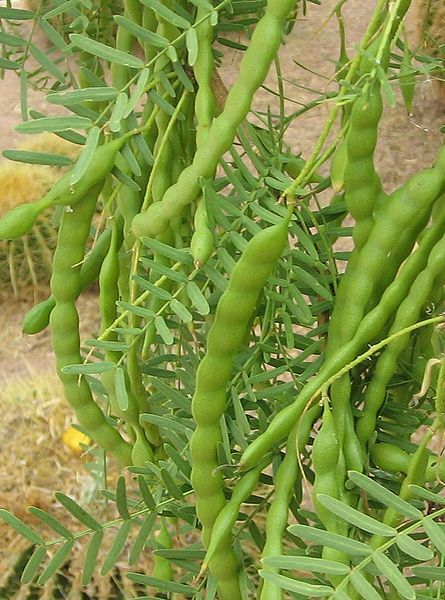 Although mesquite (Prosopis species) are prohibited in Australia (mesquite is a declared weed in all states), because they can form thorny thickets which could pose problems for livestock farmers and because their thorns can puncture tyres, they do provide an excellent food source. Mequite meal, made by grinding up the pods and seeds, contains 10 – 17% protein, and is high in lysine. 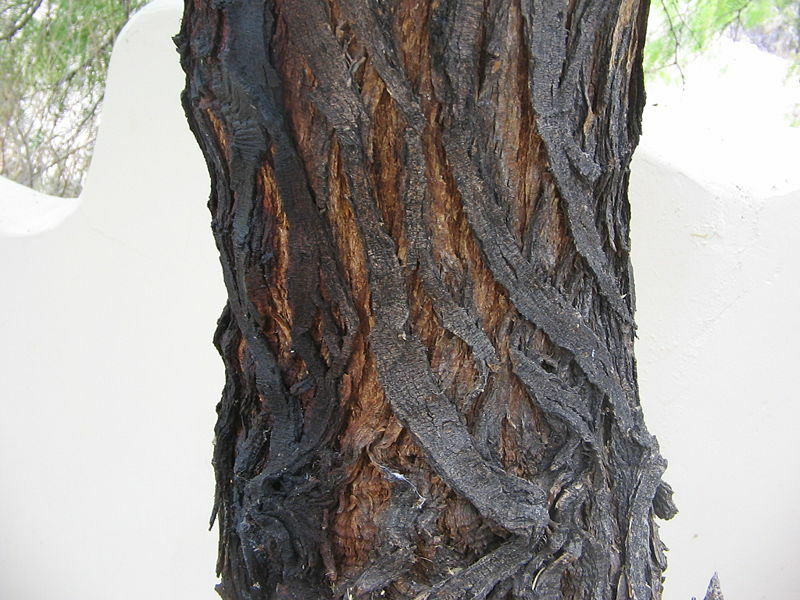 Most mesquite species (there are around 40 of them) are small trees or large shrubs, native to desert and xeric regions of north and central America. They may have one or multiple trunks, and the leaves are light green to blue-ish green. Some are evergreen, while others are deciduous. Many species are thorny, although not all. Spikes of small greenish, cream or yellow flowers form in spring and summer. Extended flowering may occur August-December, with pod formation October-March. The pod is flat and 5-20cm long, compressed, straight to curved, smooth or with slight restrictions between the seeds. Ripe pods are yellow, purple, or yellow with purple streaks and patches. The flat seeds are oval or elliptical 2.5-7mm long by 2-3mm wide, each enclosed in a flattened fibrous case, and surrounded by sweet pulp. Once the pod is dry the whole pod is edible and can be ground into flour and made into bread. 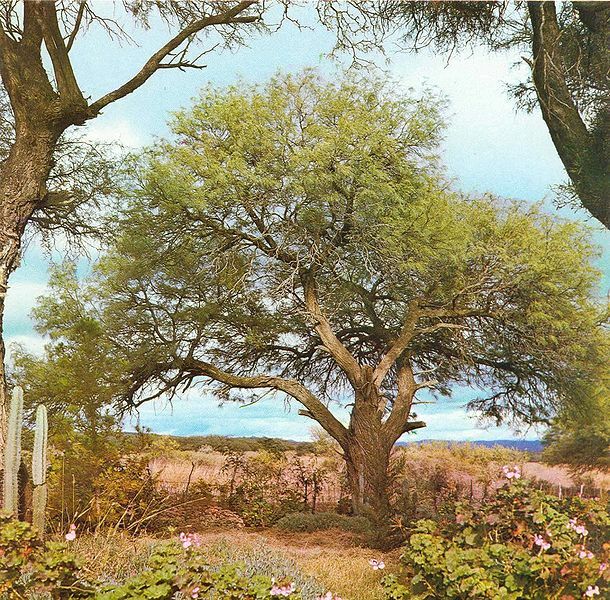 Mesquite pods were widely used in the past by the indigenous peoples of North and Central America where mesquite trees grow, and are still used as a staple food by many people in Mexico. Mesquite meal or mesquite flour can be used to make bread, or it can be added to soups and stews, casseroles, and sauces. It can also be used in pie crusts, used in vegetable and meat dishes, or sprinkled over fruit desserts, puddings or ice-cream. Like carob and wattleseed, mesquite has no gluten (or gluten-like components), so in baked goods it gives crumbly rather than chewy texture. It is also strongly flavoured, so is best used in combination with a milder flavoured flour (such as wheat, millet, or rice flour, ground almonds, or cornmeal) or as a flavouring accent. 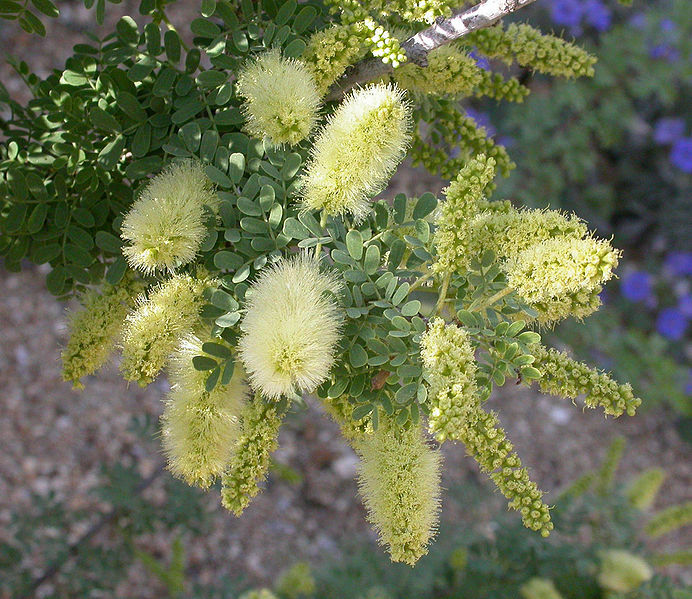 Recipes calling for mesquite can use wattleseed instead, and vice versa. * Avoid very watery fruits, such as melon, passionfruit, or prickly pear. For 1 cup of mashed fruit, use about 2 large bananas, 3 pears, 4 – 6 plums, .. Combine the mesquite meal, flour, baking powder, baking soda, and salt. Separately, mix the sugar or honey, fruit, oil, milk and eggs. Combine the fruit mixture and the flour mixture, mixing thoroughly. Pour into a greased loaf pan, and bake at 180 degrees C for about an hour, or until a skewer inserted into the centre of the cake comes out clean. Cool for ten minutes before removing from the loaf pan.